Selly Oak Park needs your help. We currently have two vacancies on the FoSOP committee. This involves about 7 meetings a year, delivering leaflets (about twice a year) and helping at the the Selly Oak Festival (30th June 2012). If you would like to become a committee member contact chair @ friendsofsellyoakpark.org.uk. We would also value casual help with any of the following. Delivering leaflets, Stewarding at Selly Oak Festival, Conservation work in park - again contact us at the e-mail above. 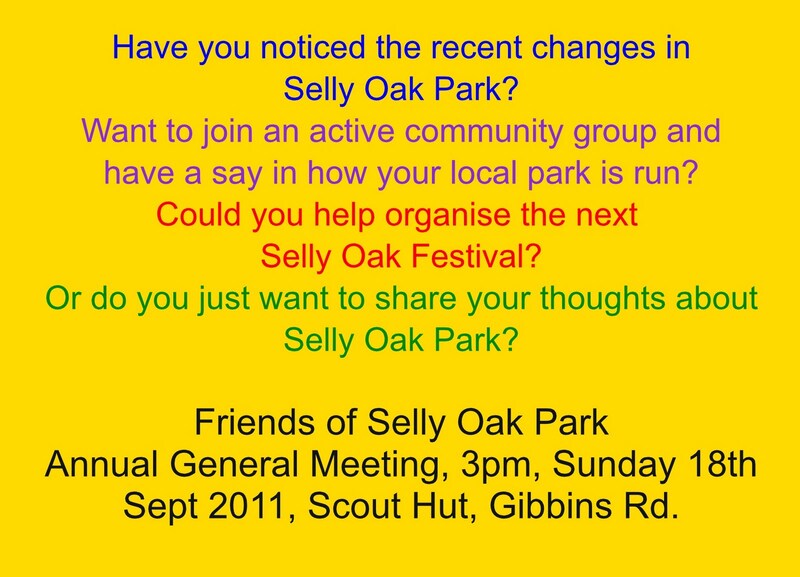 All who live in the Selly Oak area, use the Park or have a connection with it are invited to attend our AGM in the Scout Hut, Gibbins Road, at 3pm on Sunday 18th September. We are pleased to introduce this basket ball chute as our latest item of play equipment. If you've not been down to the park in a while why not come and try out our new climbing frame and zip wire too! 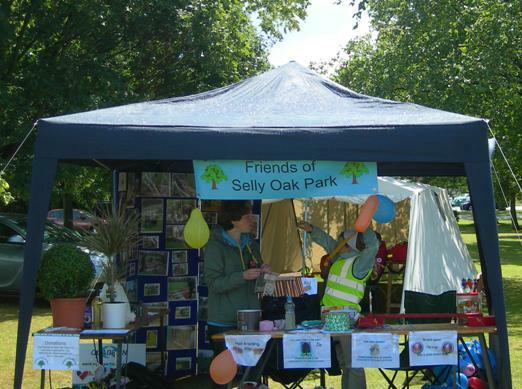 The Friends of Selly Oak Park would like to extend a big "thank you" to all who came to the Selly Oak Festival, and to the stall-holders for making the event such a great success: Ariel Scouts, Friends of the Earth, St Mary's School, Tiverton School, Harborne Lane Allotments, Here 4 Animals, St Mary's Church, History Corner, Liberal Democrats, Christian Life Centre, RSPCA, Blue Cross Animal Centre, Labour Party, Vineyard Church, Stonehouse Gang, Kurdish Education Centre, Lapal Canal Trust, Hands off Bournville School, Water Mill School, Northfield Manor School. Special thanks to Councillor Dave Radcliffe for refereeing our football tournament. Thanks also to the following organisations for their support: Birmingham City Council, Quadron, Robert Wilkinson's Funfair, British Red Cross (First Aid), and West Midland's Police. Finally thanks to our paid acts, Bloco Louco Samba Band and Black Mountains Falconry of Wales. Zip down to the Park and try out the new Zip wire and climbing frame during the rest of the school holiday. When you have had a go, please come back to this website and tell us what you think about the activity zone - fill in the play equipment survey (see the bar on the right). ... and complete the survey. 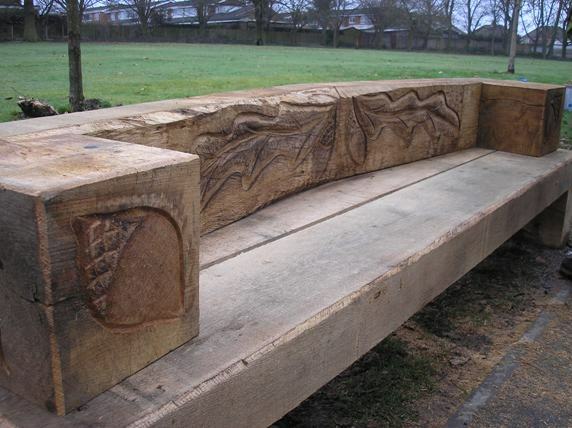 If you see anyone vandalising the Park and damaging any of the facilities and features there please let us know. Use the phone the number (0121 454 7810) that is given on the notice by the Park Lodge in Gibbins Road, or call the police on 0845 113 5000. If the vandalism is extreme and in progress or if you are concerned for anyone's safety call 999. 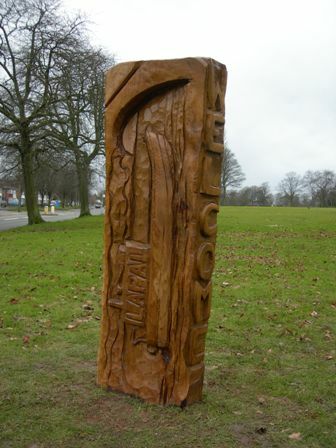 Why not take a stroll around Selly Oak Park and see how many interesting items of the new Nature, Art and History Trail you can spot. There are 17 - but can you find them all? Its an attractive oasis in a busy city - see the pictures in the gallery above. Or you could try the new zip wire and climbing frame. 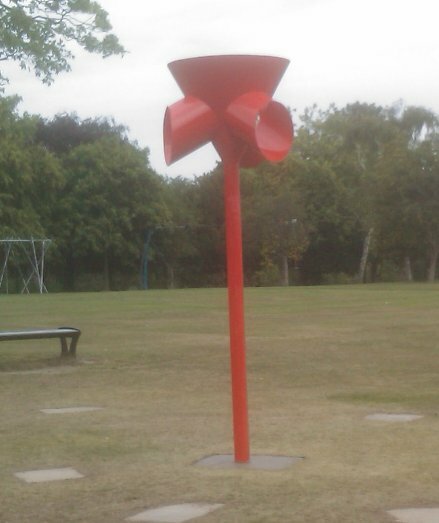 You could even fly your kite. Do you have connections with, or memories of, Selly Oak Park? What are your first memories of the Park? When did those events take place? 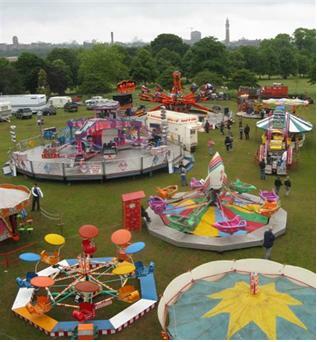 Have you got photographs of the Park in days gone by? Would you be willing to share memories and photographs with us? 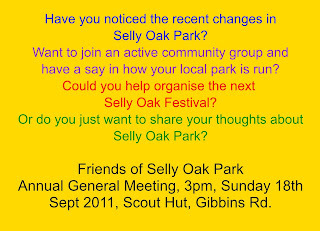 The Friends of Selly Oak Park would be delighted to hear from you. 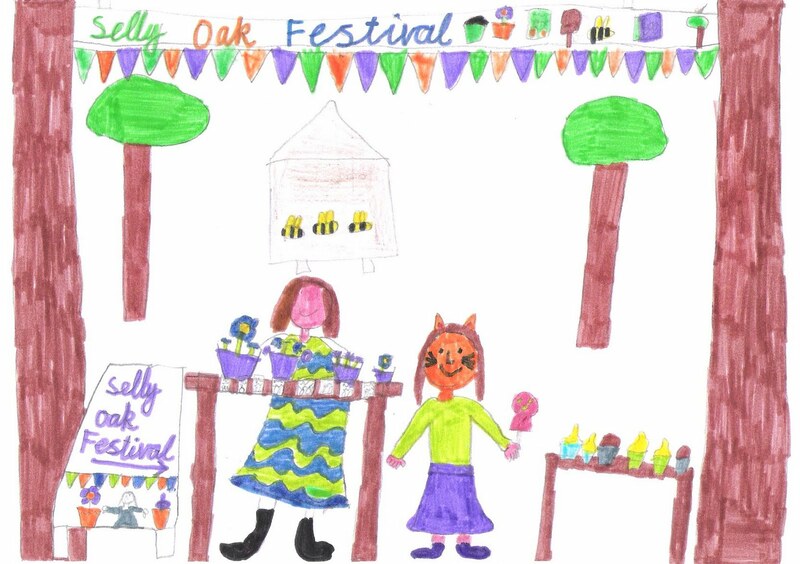 You can comment or post a reply here or, if you would prefer, you can send an email to: history@friendsofsellyoakpark.org.uk.